Since 21 May, Galerie m Bochum has been showing two parallel exhibitions of the most recent works of Spanish artist Paco Fernández (born 1950) and sculptures and drawings by Italian artist Giuseppe Spagnulo (born 1936). Placing the works of these two artists with their extremely dissimilar means of expression side by side makes for a fascinating, tension-laden contrast: lightness, playfulness and bright colours in the objects created by Paco Fernández come up against the heaviness and massive presence of the iron and steel sculptures and the deep black of the powerful drawings by Giuseppe Spagnulo. The works of Paco Fernández brighten the rooms of Galerie m Bochum with a cheerful, broad palette of colours. Liberated from any monotony or formal stipulations, they assert their autonomy of form and colour. The works are composed of pieces of wood of various sizes and cuts, which are arranged at varying angles and positions to form a structure. 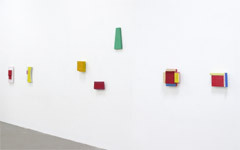 Some seem to float weightlessly before the gallery walls, while others display a strong presence attributable to their native forms and powerful tones of red, orange, yellow and blue. Fernández’ work is buoyant, flooded with light and colour. But at the same time it is earnest, with multiple layers leading the eye into mysterious depths. 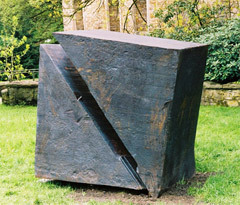 Several pieces take up the shape of the cross, freeing it from its rigidity and bringing it to life. Other seemingly monochrome white pieces exude an inner radiance, appearing to be surrounded by a mysterious aura of light. These works are contrasted with the massive sculptures and forceful drawings of Giuseppe Spagnulo. 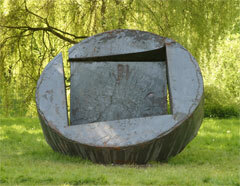 Joining the sculptures already installed in front of the gallery and in the palace gardens are two new works by the artist on the grounds of Weitmar House: “La Grande Ruota Ferro Spezzato” and “Ferro Spezzato – Blocco”. Each asserts an immediate and imposing physical presence, confronting the viewer with sheer weight and mass. In both forged steel works, Spagnulo started with an elementary geometric shape and then split the many tons of steel into two new forms. “La Grande Ruota” is based on an 80-cm-thick disk out of which Spagnulo burnt the largest possible square and bent it downward until outer circle and square were at an angle and yet at the same time supported each other. Splitting the massive piece of steel into two forms seems to suspend the laws of gravity, making the heavy material suddenly appear strangely vulnerable, alive and fragile.